In the years immediately following the Otago gold rush, readers of the Otago Daily Times and Otago Witness were treated to a series of lively accounts of "rambles" around Dunedin and its hinterland by Peter Thomson (1823-79), and Otago Daily Times proofreader and pioneering naturalist, writing under the name "Pakeha". Thomson's detailed of botany, vegetation, clearance rates and suburban development are regarded as among the best contemporary records of Dunedin. A collection of Peter Thomson’s published articles has been compiled by his great-granddaughter, Mary Skipworth, and can be viewed at genealogy.ianskipworth.com/pdf/peterthomson.pdf. In this three-part account he is on holiday and walking to the Tuapeka goldfields. The destination "El Dorado" promises much, but Pakeha finds it a bitter disappointment. Holidays are useful in many ways. They serve to break the uniform routine of one's daily labour, and are especially pleasant to look forward to, and, if well spent are equally pleasant as a retrospect. The writer's holidays have generally been spent in the neighbourhood of the coast, and he had never been far from the sight or the sound of salt water. On the present occasion he arranged to work his way inland, and as he had never seen the diggings, determined to make his way to some of the nearer auriferous centres. 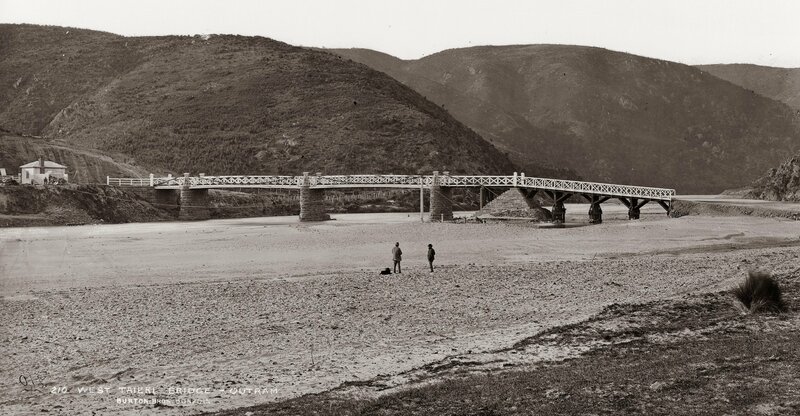 With this end in view, he proceeded by way of West Taieri, over Maungatua to Waipori, where there are some pretty extensive gold workings, and proceeded on over the ranges to Lawrence, in order to have a look at the celebrated Blue Spur. The following are a few notes of the route taken, places visited, etc. I started on my round from town over Maori Hill by Balmacewen to Half-way Bush, and thence over the Kaikorai Ranges to Silverstream. This was a very agreeable walk; a fine day, though there was a strong westerly breeze blowing, which at times blew up to a gale on the tops of the rises, and made progress ahead rather slow. But there was no hurry, and I was soon on the other side of the hills, and bowling down the long slope to the plain. This road has been immensely improved of late. Those who remember the dangerous zig-zags which had to be gone over in the old racecourse days will hardly recognise the place now, so comparatively easy is the grade. I had a rest at Silverstream, and then proceeded along the northern edge of the plain, towards Outram. Harvest operations were nearly concluded in this portion of the Taieri, but there was still a good deal of crop out. Leading in was proceeding here and there, and it was pleasant to see the big loads of grain moving about towards the stacks. The thriving plantations of trees in the neighbourhood of Mr D. Reid's property, mark an improving sense of the utility of trees to ameliorate the climate, and form a pleasing contrast to the otherwise bare appearance of the country in the vicinity. Very few of the Taieri farmers have any trees about their premises. Even a few blue gums about a place help its appearance wonderfully, while at the same time they pay for their space by the shelter they give, though they are too greedy to do much good to other trees planted near them. Jogging along steadily, I soon passed along the plain, and entered on the main road to Outram, arriving at the bridge shortly before 7 o'clock. The river was low, just covering the shingle beds, and looked dirty compared with the Silverstream I had crossed shortly before. Passing through the little township, I took up my quarters for the night in the old Outram Hotel, which I found a very comfortable hostelry. After a hearty tea, I went out to visit a friend, and on returning found rain had come on. The wind also piped up during the night, with frequent rain squalls, which made the prospect of a fine day rather shaky. However, when morning came the wind had subsided considerably, the rain had ceased, the sun shone bright, and everything looked rosy. After breakfast, I started on what turned out a very heavy bit of work indeed - the crossing of Maungatua to El Dorado. Turning to the right, the road from the plain is carried by a sidling up a rather steep spur for a mile or so, and then the track over the mountain turns up to the left. The ascent is continuous for a long distance, there being very little level ground. I was glad to find the track very well marked - quite plain in fact - so that there was not the slightest chance of losing my way. This was entirely new ground, Pakeha's peregrinations previously never having extended thus far, and a bright look-out was kept for anything new in the botanical line; but it was soon found that it was far too late in the season - the flowering was nearly all over. It was notice-able, however, that some things common enough on the plain out of flower, were, as the elevation got greater, found flowering or just out. I passed the place where the ``sticking up'' took place in the early days of the diggings, when the track I was travelling over was nearly as well trodden as any street in town, and I could not help contrasting then and now, when I was the only wanderer within miles. As the top of the long ascent was neared the want of water made itself pressingly felt, and it was with the utmost difficulty I succeeded in getting a few mouthfuls from a deep hole at the side of the track. After getting above the trees a trig station was seen ahead, and I passed from the track for the purpose of getting a good view of the Taieri plain. And a most extensive view it was. The whole plain lay there, everything on it as well laid down as if on a huge map. Saddle Hill was right in front, while Flagstaff and the hills to the north bounded the view to the left. To the right I could see down to near Waihola, the view there being dim, as if seen through smoke. The wind here was very strong, and shelter under the lee of a rock for a little to get a rest was found necessary. Passing on from this, the track still kept rising, until an elevation of over 2000 feet was gained, when the road became somewhat level, and maintained that height for a long distance. I was now fairly among the ranges, and had left all known ground behind. All round, there was nothing but bare brownish green hills, as far as the eye could see. The track wound round and along these in the most wonderful way, and I could not help admiring the skill and tact of the early explorers of the route, in selecting what appeared to me the only spur which it was possible to use for the purpose. After what seemed a very long distance had been traversed, the track began to descend. But the day was warm, and water again became a want. Two or three gullies were tried, but, though found wet, there was none of the fluid available. Besides, the prevalence of spear-grass made leaving the track rather a painful matter, and I was glad to come back to it, my ankles smarting from the pricks of the abounding aciphylla. However, I saw some distance on that the land was falling on both sides in such a way that the gully on the right side must cross the track; and accordingly, on getting down to the spot there was a beautiful clear stream of water running across. To throw off my impedimenta and kneel down beside the creek was the work of a moment, and I really enjoyed that water. It was delicious. I had a good rest here, and then proceeded on over a few more spurs, when I had the satisfaction of seeing away down the hill before me a road and a house. This was El Dorado, a well-known accommodation-house, of much repute in the days of the rush to Waipori, etc. I found it in rather a decayed condition, and ill provided with the means of making a ``square'' meal. The house had been out of meat for some days, the shepherd not having brought a promised supply of mutton, so I had to be content with tea and damper. After discussing this, I was sitting with the landlord getting some information as to my road westward, when a conveyance rattled up to the door, on its way to Waipori. An arrangement was made with the driver, and I was speedily whirling on my way over the ranges. The road was very monotonous and lonely, not a single person being met going either way; and the only thing to attract attention was an occasional glance of the Sludge Channel works and some diggings in a broad valley far away down to our left as we rose to the tops of the many hills we had to go over. Sheep were the only inhabitants of this long tract of hills. The drive was just beginning to be wearisome when Waipori hove in sight, and I was dropped at the door of the Provincial Hotel, in plenty of time for tea. While this was being got ready I sallied out to have a look at the locality, and found it a queer little place indeed, built on a small flat at the junction of two streams, and on the northern side of a wide open valley, bounded on each side by low bare hills. The town consists of a few stores, dealing in all sorts of goods, a few hotels - one kept by a Chinaman, Sing Lee - and a number of private houses etc. A neat suspension bridge leads across the river to a few stores on the other side. Peat is largely used as fuel; the place smelt just like an old Highland clachan. The whole valley, as far as I could see, was covered with mounds of white gravel, intersected by pits of all sizes and small runs of water. These, I was told, were the worked out claims, and had all been bottomed and some worked over twice. The river bed was filled with greyish-white tailings and sludge, and the water was dirty of the dirtiest. After tea, I went out to visit a large claim on the other side of the Lammerlaw Creek, where sluicing is carried on on an extensive scale. This was the first time I had seen the process of gold-getting, and was greatly interested. The face was about thirty feet deep, and over the front several streams of water were made to fall, while a huge pipe with a great nozzle at its end spouted up a strong jet of water at the foot among the loose stuff, the result being that large masses were falling down every now and then, and rapidly disintegrated by the action of the water, which flowed away in a long channel at the lower end. The water was pure enough when it fell over the face, but its state when it flowed out at the bottom amply accounted for the appearance of the river and streams around. I strolled leisurely back to the hotel towards dusk, passing numbers of Chinamen returning from their work up the valley to their lodgings in the town. NEXT WEEK: We rejoin Pakeha as he goes in search of the lions of Lawrence!